My research is in the field of experimental high-energy physics (HEP). The goal of HEP is to uncover the basic building blocks of nature and the forces between them. In our current understanding of nature, called the “Standard Model”, the building blocks are quarks and leptons, while the forces are mediated by gauge bosons. The focus of my current research is the ATLAS experiment at the CERN Large Hadron Collider (LHC). This allows ATLAS to probe the smallest distance scales and potentially produce new heavy states of matter. Most physicists in HEP believe that the Standard Model is an incomplete, low energy approximation of a more fundamental theory of nature. If true, ATLAS will be in an excellent position to discover particles, forces, and perhaps even dimensions of space that are entirely new and beyond the Standard Model. With the data collected so far, our group has searched for new gauge bosons (W’ and Z’), new strongly interacting particles called “technihadrons”, vector like quarks, and dark matter. “Search for triboson W±W±W∓ production in pp collisions at √s = 8 TeV with the ATLAS detector”, ATLAS Collaboration, Eur. Phys. J. C 77 (2017) 141. “Search for new particles in events with one lepton and missing transverse momentum in pp collisions at √s= 8 TeV with the ATLAS detector”, ATLAS Collaboration, JHEP 09 (2014) 37. “Observation of a new particle in the search for the Standard Model Higgs boson with the ATLAS detector at the LHC”, ATLAS Collaboration, Phys. Lett. B716 (2012) 1-29. “Search for high–mass dilepton resonances decaying to dilepton final states in pp collisions at √s = 7 TeV with the ATLAS experiment”, ATLAS Collaboration, JHEP 1211 (2012) 138. 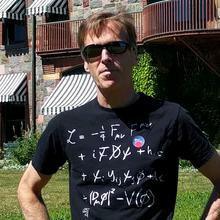 “Observation of the top quark”, DØ Collaboration, Phys. Rev. Lett. 74, 2632 (1995).